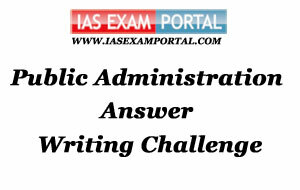 Weekly Mains Exam 2016 Answer Writing Challenge - Public Administration "MODULE- 52" | IAS EXAM PORTAL - India's Largest Community for UPSC Exam Aspirants. Weekly Mains Exam 2016 Answer Writing Challenge - Public Administration "MODULE- 52"
Public Administration- Paper I "Syllabus Topic – Techniques of Administrative Improvement : Management aid Tools like Network Analysis, MIS, PERT, CPM "
Q1. "Relations are the building blocks of network analysis'.... In the light of this statement summarize the form and content of relations in 'network analysis '." Social networks analysis is a field of study that focuses on social relations among a set of actors—people, teams, organisations. Social network analysis has been used to analyse and understand and structure of the intra-and inter-organizational relationships. In the process of working in this field, researchers have developed a set of distinctive theoretical perspective sympathetic with systems theory and complexity theory. Network theories of organisation occupy a middle ground between the study of organisations as command hierarchies on the one hand and on the other, market theories which portray organisations as atomized rational decision-makers optimizing utility.As such, network theory is consistent with long-standing schools of thought in political science, such as pluralism, which emphasise alliance-building, negotiation, and partnership. It is also related to system theory and governance theory, both of which emphasise the study of networks. There is also renewed interest in network theory simply because information technology promotes networking to achieve competitive advantage to governmental networking of states on policy issues to global networking through international organisations. There is also increased govt-govt interaction, govt-market interaction , govt-civil societies interaction and these relationships have began to influence general masses socially, economically and politically to a great extent . In administration network theory is of prior importance as it enables administrative machinery to analyse the impacts of a policy implementation in various dimensions and on different sections of society. Also it leads to a rational approach towards any modification in policies or introduction of a different policy altogether. Hence we may conclude that know and to influence the ground situation directly and effectively every organization needs to develop relations with its recipients and stakeholders so that the organisations are able to plan and act in a comprehensive manner. Indian Administration- Paper II "Syllabus Topic –Significant issues in Indian Administration: Corruption and administration"
Q2. Discuss the nature of social audit by distinguishing it from peoples audit and government audit and problems in securing effectiveness in social audit process.